I heard a song on the radio and for a moment I thought it was Saves The Day's "Do You Know What I Love The Most?" But alas, it seems like none of Saves The Day's songs have ever been played on corporate airwaves. Wouldn't life be so much better if we could switch the dial and hear something like this? Saves The Day, headed by Chris Conley, has spent more than a decade inspiring other alternative acts and entertaining the youth of America with their pre-mathcore (you like that one?! )punk ballads and sorrowful self-loathing diatribes. But my favorite StD song is another love song, "Always Ten Feet Tall." One of the bands that formed in the shadow of, and grew to become contemporaries of StD is Say Anything. 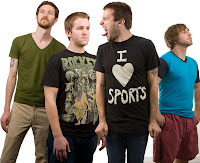 Max Bemis fronts this band and is backed by four friends. 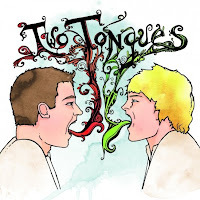 "The Two Tongues record is really an expression of the yin and yang; how two "opposite" souls stimulate and battle each other in any truly loving relationship. Chris inspired me as a mentor, hero and friend, and I inspired him as someone who truly cherishes his work that he can respect in his own right. Chris sometimes looks down on himself but is inside a very strong, almost Buddha-like centered soul; I have that whole Steven Tyler/Jerry Lewis extrovert personality onstage but I'm a totally neurotic, restless soul inside. We as two people, therefore, express two sides of a coin." If you followed the Say Anything link to the blog post I wrote about them back in August, you would know I love the two bands almost equally. So I should love Two Tongues. I've tried so many times. It's been out for three months, and I am just now writing this. (Well, that's mostly because of the whole false excitement over the radio thing this morning.) [update]By the way, it's the intro to Blink 182's My Girlfriend. I like that song, but I hate that the local "eggstreeeeeme" station thinks that is has to be played every single morning. The album starts out with Max's powerful voice, a lead guitar and percussion with the strength of an angry Say Anything album, and the haunting background keys reminiscent of a Saves the Day song. Then Chris joins in on vocals, and it sounds like the perfect blend of two soulful sounds. But then Track 2, with the two trading off lines as if they are singing to each other, causes sufficient creepiness as you wonder just what the hell is going on? Listeners are just plain confused. Is Conley playing the part of some girl who dumped Bemis? Is Bemis consoling Conley over the demise of Saves the Day? Or is this just an internal dialog and a wildly experimental song? The album doesn't lose the creepiness factor as it moves along, unfortunately. Believe me. I said it before; I want to love it so much. It's moving to imagine two artists, whom I respect so much, getting the opportunity to be creative in this way. But I really could live without hearing Chris Conley singing "Hey there boy, you're beautiful." In case I haven't already protested ad nauseum, I love the sensitivity these two have been able to convey on all their previous music. But this just went too far for me; maybe I just need my men to err on the side of The Beast With Impenetrable Feelings. I can't say anymore. I've said enough. You know how I feel. Tell me what you think. I've seen both bands live. I love them. I've got all the old stuff and rare stuff and unreleased stuff. I'm just not smellin' this record.